John 11:25 - Jesus said to her, "I am the resurrection and the life; he who believes in me, though he die, yet shall he live." 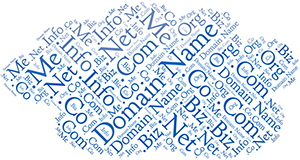 The core group of generic top-level domains consists of the com, info, net, and org domains. In addition, the domains biz, name, and pro are also considered generic but they are designated as restricted because registrations within them require proof of eligibility within the guidelines set for each. There are now more than 1,200 new gTLDs which are not specific to a geographical location and are not part of the core group of TLDs.These gTLDs offer a great opportunity to really brand your service or organisation as they are still a relatively well kept secret. Anyone who knows me knows that I am very keen on tabletop or modern boardgames. As an example of a gTLD I have registered boardgames.games which redirects, via an alias, to my new (under construction) board games website Lanky Gamer. mickwood.com are able to register more than 400 of these new gTLDs and a list of them appears below. Prices vary widely so please email mick@mickwood.com for further information and prices. Online Domain Name search tool. Online Domain Name availability checker. Registry for .uk internet names. A not-for-profit partnership of people from all over the world dedicated to keeping the Internet secure, stable and interoperable. Information regarding Internet Domain Name Registration Services.